Lost was a show that aired for six seasons from 2004 to 2010 on ABC. It started out as a story about the survivors of a plane that crashed on a mysterious island, and evolved into a full blown sci-fi, time traveling, confusing mess of a show that I just couldn't stop watching. 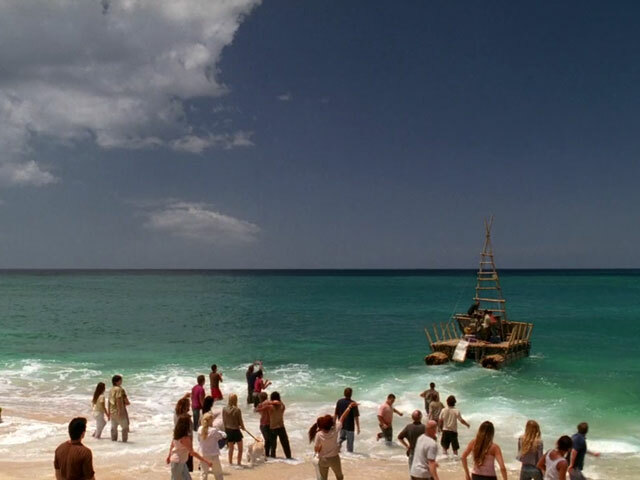 After losing all radio contact and going a thousand miles off course, Oceanic flight 815 crashed on a deserted (or so they thought) island with no hope of rescue. The survivors had to learn to work together to fight the elements, ferocious beasts, each other, and the Others - those who lived on the island before they came. Then, rescue came in the form of more trouble that allowed some of the survivors to leave while the others were left on the island to deal with another problem: time travel. The time jumps eventually stopped, but all those that were left on the island were stuck in the 70's with the Dharma Initiative for three years, and the ones who left the island finally found a way back. Then they set off a hydrogen bomb in the 70's and got sent back to the future where they sat around for awhile until some of them got off of the island again. In the end, Lost was about too much and nothing all at once, and since nothing ended up being resolved in the end, I'm leaning more towards the nothing. What made Lost interesting from the beginning was the diverse cast of characters and the various mysteries surrounding the island they were stranded on. Everyone came from different walks of life, only a few knowing each other prior to the crash, and they were forced to coexist on an island together after the plane crash, so it was interesting to see these relationships form between people that never would have met otherwise. My favorite characters were Sawyer, Charlie, Ben, Desmond, and Daniel. All of them were completely different and were all played by amazing actors who deserve all the praise in the world for the work that they put into Lost. Sawyer evolved more than any other character on the show and it was gradual and believable, Charlie was an awesome character who overcame addiction and came to create the sweetest little family with Claire and Aaron before he died a hero, Ben was such a great "bad guy" and I don't think that anything could ever make me not like him (which might be because Michael Emerson was just brilliant playing him), Desmond was always the center of the most intriguing storylines and ended up kind of being the most important character of them all, and Daniel was the adorable bumbling physicist who came to the island on the freighter and stole my heart. I loved them all and was pleased that Sawyer, Ben, and Desmond all made it to the end of the show unscathed. It's a shame that we'll never learn what happened to them after Jack plugged up the hole because as it stands, their stories are completely unfinished and that makes me sad. On the flip side, the worst part of the show was the introduction of new characters for no reason. There were some successes such as Ben, Desmond, Daniel, Miles, and Juliet, but there were just as many or even more characters that were brought in, introduced poorly, and had no chance to really develop as characters before they were killed off for nothing more than shock value. I didn't mind the death of Ana Lucia (because I didn't like the character at all and she had two flashback episodes), but Libby had no chance to grow at all. She was a very mysterious character with a lot of potential, and we never found out who she was. Another issue I had with the show was the character of Jack. I never liked him and I don't think that a show like Lost needed a "main" character, especially when the chosen one was the least interesting out of the whole cast. The entire last season was also a giant misstep. The writers had a chance to tie everything up nicely, give all of the characters fitting resolutions to their stories, and make Lost go down in tv history as a revolutionary show that went out as good as it came in. However, it ended up just kind of fizzling out at the end and rendering the entire show pointless. I was as obsessed a Lost fan as you could be in its heyday, but I can honestly say that since the series finale aired in 2010, I have not had any desire to revisit the show in any fashion. I still have fond memories of several characters and storylines, as well as all of the amazing discussions and fun times on the Fishbiscuitland forum, but Lost as a complete series just doesn't hold up at all. I don't regret all of the time I poured into Lost, as it was a great fandom experience, but it did teach me to be more selective about the shows that I watch as well as that it is okay to bow out when the quality declines. I didn't think so at the time, but looking back once everything was over, the show lost me after the season 3 finale with Charlie's death and the introduction of the flash forwards. I did enjoy some of the later storylines and characters, but the show as a whole became greatly less enjoyable for me when season 4 started. I didn't want to admit it at the time since I believed in the writers and thought that we were working towards something awesome, but I just had a gut feeling that the show was not going in a direction I expected or wanted. Too much focus was placed on Jack, other characters were tossed to the wayside and their stories remained stagnant, too many more unanswered mysteries were introduced, and the show just didn't go anywhere. It was just stalling until we got to the end, and once we got there, it ended up in one of the stupidest places I could have imagined. I don't know how I expected the show to end, but I know that I thought it would be a bit more creative and imaginative then all of the characters meeting up with their "true loves" after they died and then going off to heaven together. I didn't care about the destination at all, once Jack was finally dead all I wanted to see was the journeys that the surviving characters took once all was said and done. It all just feels completely unfinished except for the story of Jack, my least favorite character and the one that I cared the least about in the entire series...yay.